We have worked on creating our non-chronological reports for a number of weeks now. So much work has gone into this and I am incredibly proud of this amazing little girl for the spectacular piece of writing she has created. But the best part for me is, I know she is proud of herself. 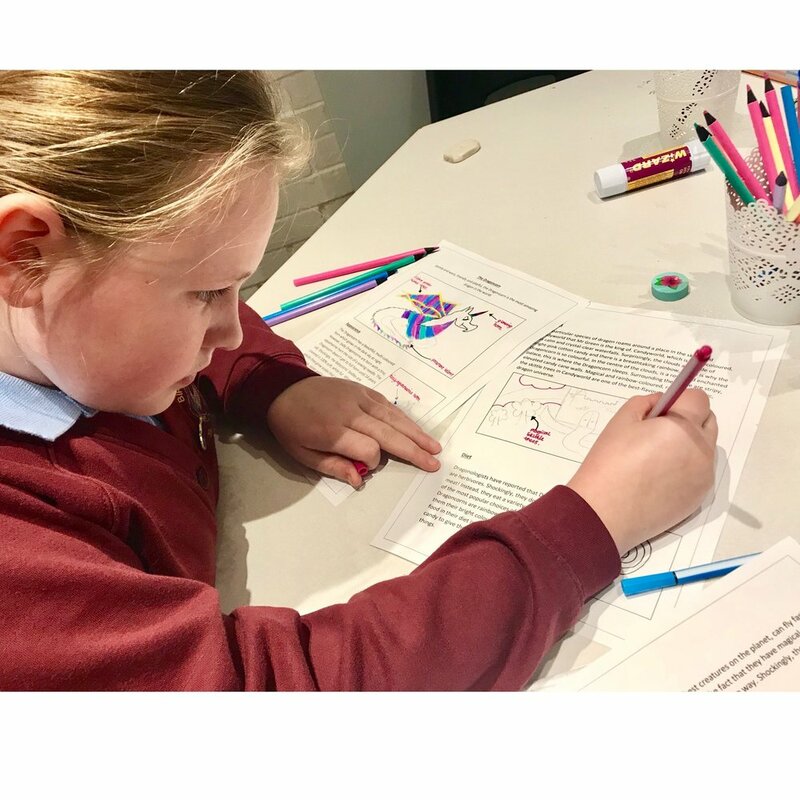 She is so excited to show her class teacher what she has achieved and this positive experience with writing is even better than the fantastic content, in my opinion. 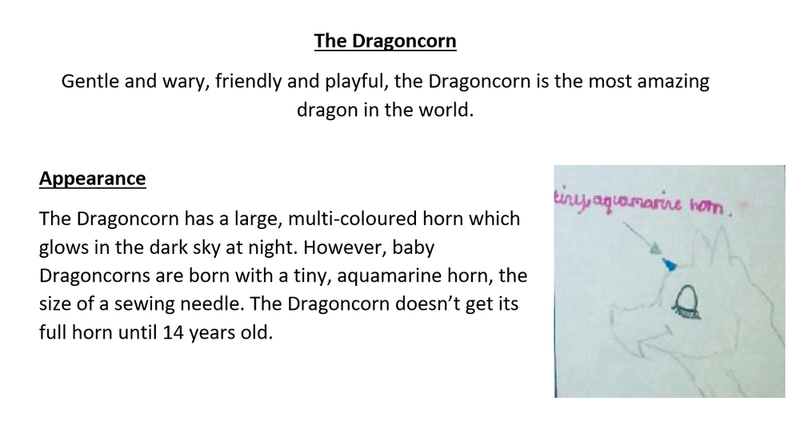 Interested to know what goes into creating a piece of writing like this from scratch at a Lower Key Stage 2 level? Step 1- As we didn’t know what a non-chronological report was, we first needed to analyse a WAGOLL (What A Good One Looks Like) and identify features of a non-chronological report. What is the purpose of a NCR? Step 2 – Take a more in depth look at a range of non-chronological reports. Are there any ideas we would like to ‘magpie’? What language features and literary devices would we like to use in our own? Step 3 – Learn about and practise using desirable language features discretely. We looked at 2 pair sentences, sentences containing fronted adverbials and sentences containing a relative clause. Step 4 – DESIGN A DRAGON! 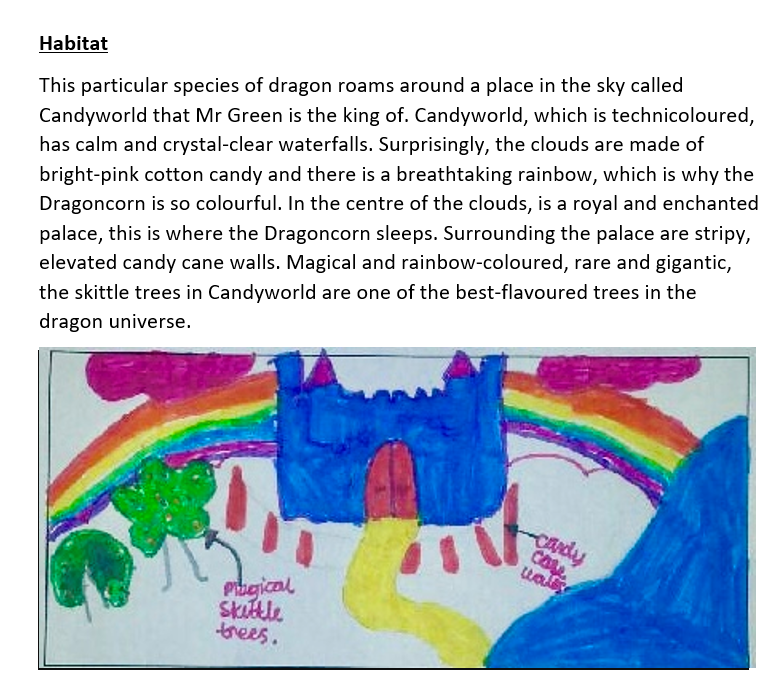 Step 5 – Consider our four main headings (appearance, abilities, habitat and diet) discuss these orally at length making notes on our plan as we do so to ensure we remember all of our fantastic ideas! Step 6 -Enhance our vocabulary – Vocabulary, vocabulary, vocabulary – IT’S SO IMPORTANT! Gather words and phrases to help our writing ‘pop’ using resources such as Mrs Wordsmith, Thesauruses (books and online) and Descriptosauruses. We spent a good amount of time discussing different ways to describe colours! Step 7 – Start writing! Focusing on one paragraph at a time. Step 8 -Edit – Consider spelling. Punctuation and grammar carefully. Have we made any errors? Is there anything we could add in or change to make our writing more coherent or engaging for the reader? Throughout the entire writing process, continuous feedback is provided. This is essential so that children know what they are doing well and how they can improve. Usually, where appropriate, I then type up each child’s written work and print off copies which they can share with their parents, class teachers etc. 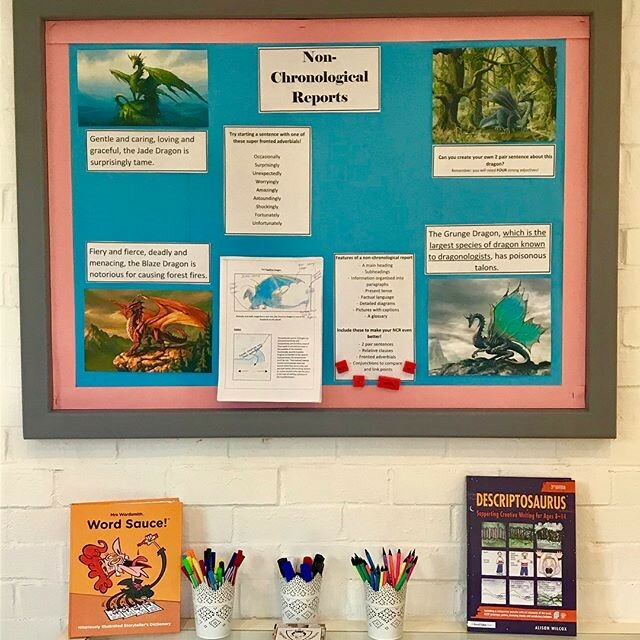 We also have a ‘writer’s corner’ in The Schoolroom where, if children wish, they can leave a copy of their work for others to read and admire! I think that it is important for children to recognise that the work they do has a purpose, it can entertain and bring joy to others. 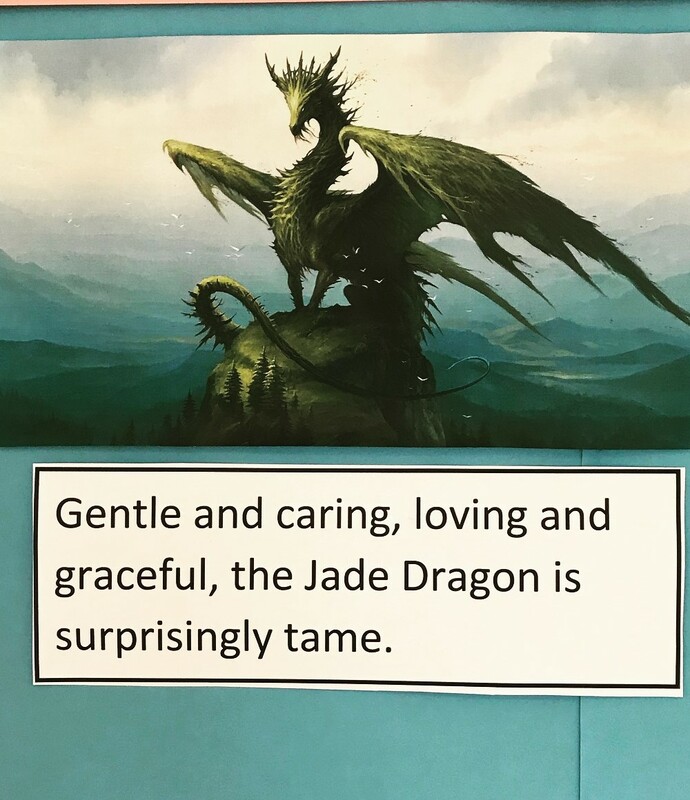 It’s something for them to be proud of and not just another mundane task that they ‘have to do because the teacher said so.’ I feel that in doing this, children take ownership of their own learning, they strive to improve and form a positive and rewarding relationship with the process of writing! Please note: Permission was granted from parents for the Schoolroom to use these images. They are not for public use.